Goshen Canyon is an interesting place. There are several old mines, most extend back about 50 to 75 feet. 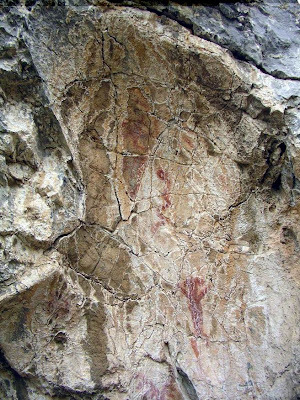 There are also pictographs that are very similar to the ones in Little Rock Canyon. 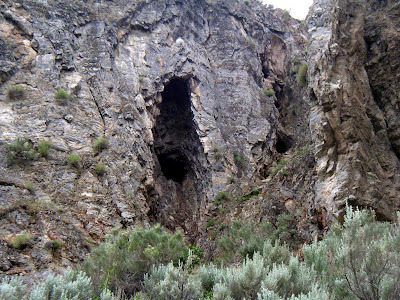 There is a cave further up canyon named "Bat Cave", and one trip was all I needed to realize why it has its name. It must be the home to every bat in Utah. It really doesn't go very far, unless you are willing to crawl through guano. As we attempted to crawl into this hole, a racoon hissed at us and we could see it feeding her cubs just inside.